Written by Fiona Monaghan A Shepherd Looks at Psalm 23 by W. Philip Keller was an eye opener for me. Many of us know the Psalm that starts “The Lord is my shepherd I shall not want…” and there are references made throughout the Psalm to physical things like rod, staff and oil. Mr. Keller explains how a shepherd would actually use these tools in his vocation and what it means to us. 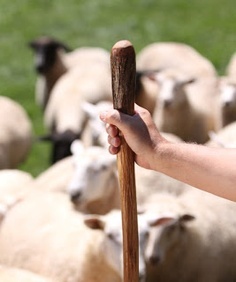 The Rod was a weapon made from a sapling specially chosen and whittled down to suit the shepherd. The root was used and shaped to fit the shepherd hand. He would use this in a couple of ways. If a sheep was wandering off, as they are prone to do, he would throw down the rod to startle the sheep back to the group. It was used to check the condition of the fleece. Checking the skin by parting the fleece with the rod looking for sores, ticks etc. It was the ultimate protection tool used as a deterrent for predators and beating the bush for snakes etc. Whereas the rod was protection, the Staff was considered a tool of help or compassion; not for defense, but for rescue. If a newborn lamb got separated from its mother, the shepherd would use the staff to lift it back into proximity of the mother and not put his human scent on it. If he needed to draw an animal back into the fold he could reach out and pull them closer; used to rescue a wayward animal if it got caught in thickets or brambles. Also a means of support for him to lean on and assist his walking and used for guiding sheep on a new path. The Oil referenced was a healer. It was put on sores or scrapes to prevent infection. Flies would bother the sheep and want to lay eggs in their nose, so the shepherd would put a coating of oil mixture to prevent this. A distraught sheep having to deal with these flies would disrupt a flock so it was very important to treat them by anointing with oil. It was no mistake that we as a people were referenced as ‘sheep’ and Jesus our Shepherd. Sheep are not the smartest of animals. They tend to follow rather than lead. They are totally defenseless in the proximity of an enemy so need a Shepherd to protect them. How often have we needed the Oil of healing in His words at a difficult time, or the Rod of correction if we are heading off in a wrong direction or the Staff of comfort when needing to know we are not alone. Read Psalm 23 with the meanings of these words made clearer. See how this might be useful in your own life.